Future Spacesuits Should Be Beautiful — and Not Just for Space. Here's Why. 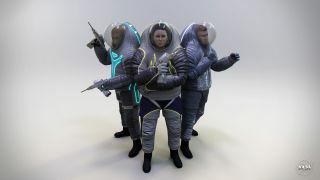 NASA and independent researchers are working to design new and improved spacesuits for the next generation of off-Earth travelers. Dava Newman, an aerospace engineer at the Massachusetts Institute of Technology, wants to change that. She is designing what she hopes will be the next generation of spacesuits — which will give the life-saving devices the bulk and style of something more like athletic or camping equipment. That design transition requires a change in the way the suits create pressure on the astronaut, which is done to keep an astronaut's blood liquid and moving throughout the body. (Without enough pressure, it could turn to gas.) For all of spaceflight to date, that pressure has come from filling the spacesuit with pure oxygen, putting the astronaut in a bubble of gas. Newman wants to create that pressure mechanically instead, with a suit that clings to skin. We spoke with Newman about her research. This interview has been edited for length and clarity. Space.com: Why did you want to tackle the spacesuit problem? Dava Newman: My passion is trying to think about how to get people to Mars, so what could I do? What would my contribution be? I love the current [spacesuit] system. I've studied it. To me, it's really the world's smallest spacecraft. As an aerospace engineer, the design challenge is how do you take all the functions of a spacecraft, miniaturize them and put them right around the person? It's an incredibly hard engineering and design challenge. Our current systems that are gas-pressurized shells are fantastic, both from NASA [and from] Russia. But for the last 50 years, we've had people in gas-pressurized suits. They keep them [the astronauts] alive, and they do great work, but they're really coming to the end of their life cycle. So we need new systems, and we have a couple design choices. We can kind of do it the same way and be incremental — not my choice — or say, "How else can we do it?" Space.com: What timeline are you looking for your next steps? Space.com: What sort of medical implications does your research have here on Earth? You've talked about students you work with at Harvard University who are studying to become aerospace biomedical engineers. What sort of projects have they worked on? They're not walking yet. Their brain is so plastic. Maybe if they go through certain motions and certain motor programs in our little suits — we did make suits for infants and take lots of measurements, because maybe we could help the range of motion — then, when the young person is about 2 years old and they start walking, maybe they would have extended range of motion and better muscle control and better muscle performance. … We're always thinking about how do we miniaturize things, how do we do wearable sensors. … Everything's so expensive to get in space. You don't get to fly a lot of instruments, so when you fly them, you really have to miniaturize them. And when you do, they just have great applications, usually, on Earth, for rural medicine, telemedicine, those kind of uses. That's exciting, because you feel like maybe we can make a difference on Earth. Space.com: Aesthetics clearly play a role in your designs. Why is that important to you? Newman:& It's always about teaming [up with others], because engineering, we solve some of the technical questions, the technologies, materials. But, yeah, I always work with designers and artists. It's a lot more fun. You want to wear beautiful things. You want to have a great suit and [one that] looks good. … It doesn't cost any extra money to do it right and do it very aesthetically, and I'm always learning as well from multidisciplinary teams, because bringing people together, they might have a different solution. I come at it usually from an analytical or technical [perspective], and you bring artists together, you bring designers, and they're going to really push us on form, functionality, things like this. So, we just make good teams — and have fun."